1) How would you define/describe a gospel-centered response to stress? 2) Can you think of any hymns or contemporary songs with lyrics that speak of this in some way? I am still somewhat new at this whole applying-the-gospel-to-every-aspect of life thing. So I would love your input :) Incidentally, as I typed this post, God brought to mind something I read from Piper a while back which I think applies here...but I'll save that for another post and wait to see what kind of response I get. "It is the LORD your God you must follow, and him you must revere. Keep his commands and obey him; serve him and hold fast to him" (Deuteronomy 13:4). *What is the difference between "keeping His commands" and "obeying Him"? One focuses on the words--the commands--it's about rules, guidelines, standards. That's important. But it's not the be-all, end-all. The other focuses on the Person--it's about relationship, intimacy. It's hollow to follow rules without truly knowing (and loving, fearing, serving, trusting) the Authority behind them. The Law cannot give life--only the Spirit gives life. *We are to hold fast to HIM--not to traditions or rules or laws. To cling to Him--as you would cling to the last rock that kept you from sliding down the cliff, to the raft that kept you from drowning. To cling as a small child clings to his mother's hand or leg or neck when he doesn't want to be left alone. To cling like this is to acknowledge helplessness, to admit need. It is to be humble. But it is not only to see reality about yourself (you are helpless, needy)...it is to see reality about your God. It is to acknowledge and prize the value of the One you cling to--to recognize His strength, His authority, His ability and power to help. It is to treasure the blessing it is to be near to Him, the privilege of knowing Him. Last Sunday night, I was in the mood to bake. I have an incurable sweet tooth, so when I bake, I occasionally send the extras to work with Steve--because if it's here, I'll eat all of it. I've only sent treats with him a handful of times in the last year, but it has happened before. So when he asked if I would make something he could take to work ("Mondays are always easier to bear if there's something good to eat"), I happily agreed. He voted for banana bread with chocolate glaze (the only way to eat banana bread, in my humble opinion), and I got to baking. Monday morning, he emailed me to say that the banana bread was a big hit. One of his co-workers had already come back for seconds as of 9:30; in the afternoon, his boss grabbed a piece and commented that he was glad he hadn't known about it until then. Steve came home with an empty plate, having given away the last half-piece on his way out the door. (Thank goodness I swiped a slice before it left the house!) I was glad to have been able to bless my husband and his co-workers in a simple way, and didn't think any more of it. Until Wednesday afternoon, when Steve told me that Stan's wife had made chocolate chip cookies. Food in the office isn't totally unheard of, but uncommon enough that twice in one week was a notable occurrence. We laughed as we pictured all the guys having gone home Monday and told their wives, "Steve brought us this great banana bread his wife made!" I jokingly remarked that I hoped the other wives didn't hate me. I got an email from my husband a few minutes ago. Not to be outdone, Vince's wife whipped up a batch of brownies. From scratch. the fabulous taste of yellow cake batter--which I believe I would choose for dessert of my last meal if I were on death row. Just give me a spatula and a mixing bowl full of the delightful stuff. "Before this I just figured I was a square peg of a woman trying to fit into the round hole of home maker. There is no hope in this conclusion." " 'God, be with me (or us or them).' How often have you prayed this or heard someone else pray it?" It's a prayer that doesn't need to be prayed. "The gospel is: you are more sinful and flawed than you ever dared believe yet you can be more accepted and loved than you ever dared hope at the same time because Jesus Christ lived and died in your place." More great sound bites from the Desiring God National Conference 2006 speakers here. GEMS--I missed those precious girls last week! It was good to be back last night. a free song download from Sovereign Grace--love it! "If home is where your heart is, then my home is strewn around this world and spills into Another." Is October 19 too early to start listening to Christmas music? Between the choir songs we began practicing last night, and the free download from Sovereign Grace's forthcoming Christmas CD, I am now completely in the mood to bust out all my Christmas music. Never mind the fact that Thanksgiving is still a month away. Go check out that free song! It's a great one. I'm sooo excited about the CD! As much as I miss many things about home, I do love living in a place where fall lasts longer and the winters aren't so nasty. 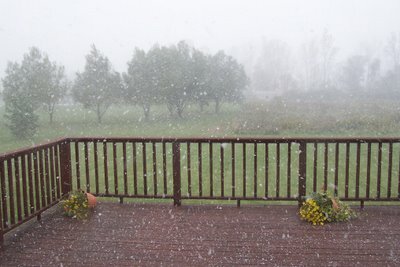 Of course, we were welcomed home by Monday's cold and rainy yuck, and a house hovering around 60 degrees...but at least it wasn't SNOW in OCTOBER. And yesterday, we were back up in the 70s. Ahhh...I love me a Tennessee fall. I have heard so many great things about Puritan theologian John Owen but have not yet read any of his work. What better incentive than this deal from Justin Taylor at Between Two Worlds: Order Overcoming Sin and Temptation through its publisher, Crossway, and receive 40% off retail when you enter the code "BTWOW" at checkout. Plus, order any other book from Crossway and shipping is free--to me, that was an irresistible excuse to buy another book a great deal! Then get a free PDF of the book as well. Here are a couple of endorsements of Overcoming Sin and Temptation. I can't wait to read it. Thursday of our week at home found me thoroughly enjoying one of Pizza Oven's famous pizza subs. Yummy wonderful burnt-cheese goodness. Then I made dinner and our friends Kaleb and Denise came over, along with their cutie-pie son, Dawson, and a sweet teenage boy who Kaleb has sort of been mentoring. 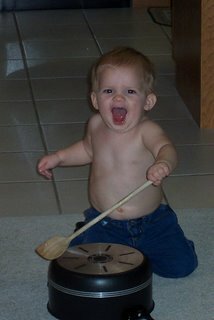 Seventeen-month-old Dawson was a little whiny before we ate--but was soon occupied with the fun of drumming on a pot. Who needs expensive toys? Friday I got to have lunch with three of my former co-workers from Project Respect (or rather, two co-workers and my boss). 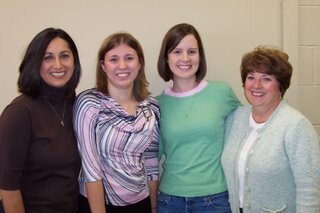 Left to right: Patty, Jackie, me and Shirley. My time at Project Respect was...well, let's just say it was one of the few times in my life where I believe God specifically called me to do something I ended up hating, yet knew He had led me to it. Maybe "hate" is too strong a word. It wasn't all bad. But I was glad to be done, for sure. Anyway, the saving grace of those nine months was these precious ladies (plus a couple of others) who became dear friends. I may not have liked my job, but I did love working with great people like them. Friday night, my college roommate Stephanie graciously drove up from Fort Wayne to see me since she was busy the day I saw the rest of the Fort Fun crew. 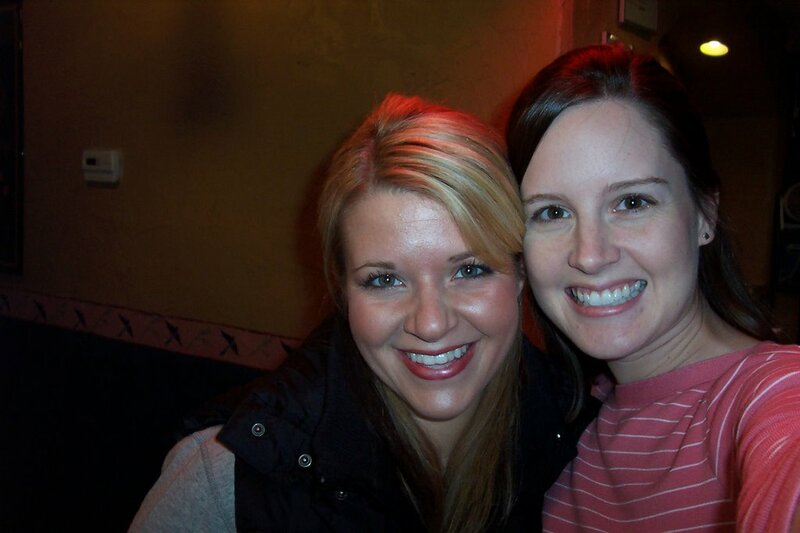 We have made a lot of memories together in five or six years as friends and roommates--Stephanie is one of those people who knows me really well and loves me anyway. She is a busy girl doing all sorts of neat stuff and I was so thankful that she made time for me. I loved hearing about all she's up to--serving God, enjoying life. Oh, and I got a new haircut, which you can see in the last two pictures. Tuesday night I had some girl time with my best friend Julie. It is soooo refreshing to be with people who just know you...who don't need twenty minutes of back story...who understand you and can finish your sentences. I long for that here in Tennessee...but meanwhile I can't forget that God has already given it to me time and again--wonderful friends, gifts I can't take for granted. On Wednesday it was off to the city Janet affectionately refers to as "Fort Fun"! I visited my grandmother, who has Parkinson's and lives in a nursing home (so sad...always hard to see her like that). Then met Janet for lunch. 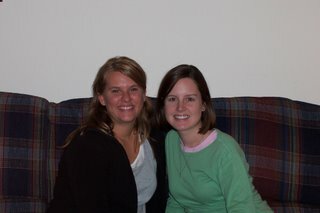 If you had told me when we were freshmen in college that we'd end up becoming good friends I would have been very surprised--not that I ever disliked Janet at all, but just that we're very different! My first impression of her was this beautiful, talented, confident girl who I assumed was certainly an upperclassman--I was shocked to find out she was a freshman like me. After a few years of chorale, communication classes together, chamber singers, etc...I am blessed to count her as a friend. Crazy and funny and just a beautiful heart. And if you were at my wedding you know how amazing her voice is. 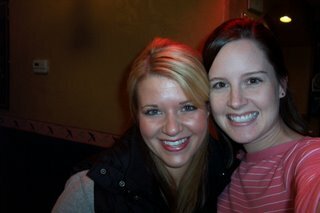 Hadn't seen her since then--so we had fun catching up. And Janet has a blog now--go check it out! 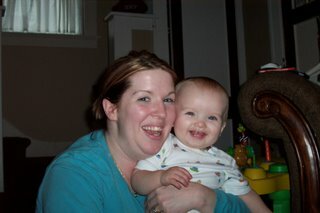 After that it was off to see one of my favorite cousins, Rebekah, and her son Matthew. The last few times I've seen her have been a rushed few minutes to say hi, so it was nice to spend a little longer with her. Matthew is growing like crazy and is completely adorable! Then I capped off the afternoon with a raspberry mocha and a nice long chat with Jaala. How much do I love this girl! I had the privilege of mentoring her in college...she is a dear friend. 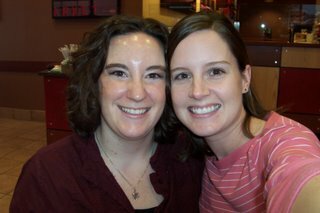 I loved sharing deeply and honestly with her (and looking at her Israel trip pictures, too). On the way home I got to listen to a CD of Jaala's composition recital--30 minutes of various types of original music, both vocal and instrumental. Stellar! What talented friends I have. I loved listening to all the beautiful songs this beautiful girl wrote. There's much more rich truth in this brief Lewis passage--go read the rest. Our "vacation" at home started off with a bang--a Kannel family trip to America's RollerCoast. Chris and Michelle even joined us all the way from New York. Can I just say, you haven't been to an amusement park until you've been to Cedar Point. 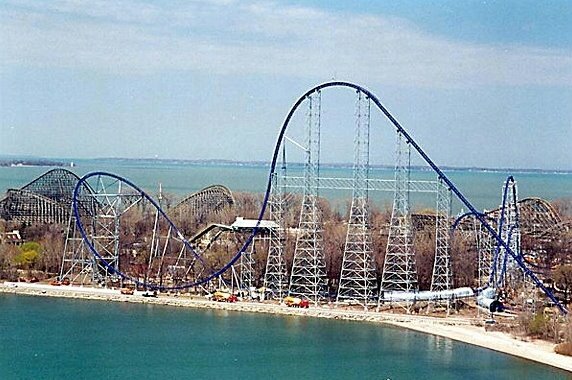 And you haven't ridden a roller coaster until you've ridden Millennium Force or Raptor (front seat). This is not an amusement park. It is a glorified county fair. This is not Cedar Point. It is a wannabe. 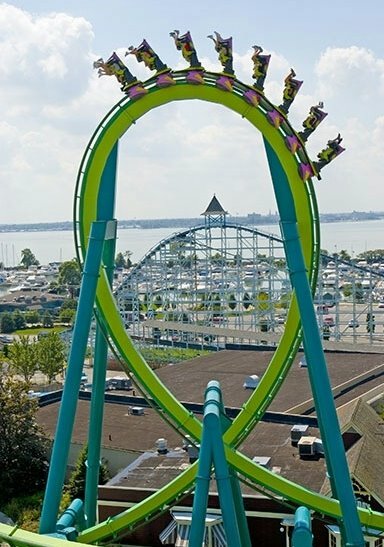 If you really love roller coasters, you need to make your way to the great state of Ohio, to Sandusky--the roller coaster capital of the world. But don't go on a sunny Saturday; you'll wait in 2+ hour lines for the best rides. And if you go in October, dress warmly. Flying down a steel track at 92 mph next to the lake at 8 pm has a chill factor of approximately -17 F.
Home sweet home...after ten wonderful days at home sweet home. At what point in life do you stop calling both the place you're headed and the place you return to "home"? It doesn't get much better than being paid hundreds of dollars to spend a week with friends and family. But that's exactly the gift God gave us last week. Steve had training to do for work and found out it was offered in Toledo. Some figuring showed his boss that although they'd have to pay a ridiculous amount of mileage, it would actually be cheaper than paying for a hotel room and every meal if he were to go to Louisville. So we packed our bags and headed for Ohio. What a blessing it was to have a long visit. Usually when we go home (Steve's parents and mine live in the same town) we are so rushed to pack in time with both our families, let alone trying to see friends. This time we had many more opportunities for QT with family, and I got to visit several dear friends while Steve was in his seminars. Good times were had by all...even Hank, who only puked in the car one time. reconnecting with one of my college roommates and her husband on Monday (at Bravo, no less--YUM!) --noticing a theme here??? One friend of mine, a missionary in Rwanda, recalled to me the day when he was asked, "If God answered all your prayers today, what would be the net effect?" His answer was simple -- he would be happy and healthy and stress free and so would all his friends and family. He was convicted of the selfishness of his praying! He was not asking for conversions, for godliness, for new churches, for new leaders. He was asking for his own comfort. I find this to be the one core condition -- am I seeking from God those things which are most on his heart? I know his heart by studying Scripture and knowing what Christ died for . . . and that is Gospel-driven praying. I don't know about you, but I've had plenty of times when I wish everything were black and white. Of course, I still believe some things are black and white. But when I got to college, I discovered that perhaps when it comes to the peripheral issues of faith, there's a whole lot more gray than I realized or cared to deal with. I believe this could be the theme song for my alma mater. For that matter, I believe it could be the theme song for a whole lot of Christians--including myself at times. Wrestling with issues like politics and art and liberty and justice is hard. It'd be a whole lot easier if someone just told me what all the "right" choices are. Then I wouldn't have to think for myself. Then I wouldn't have to actually interact with a living God who speaks to His children--I could keep a safe distance. Wouldn't it be a whole lot easier if we got an itemized list of the dos and don'ts? Wouldn't it be easier if the New Testament were bullet points? And isn't that what we in the church try to do, with all of our guidelines about holiness and morality and expected behaviors? How many of us have wished for skywriting about an important decision, rather than plodding tentatively but courageously through the lessons which are the whole point of the journey? We want someone to spell it out for us because rules are easier than relationship. They require less of us. Easier, maybe, but dead--not life-giving. The law cannot give life. The Spirit gives life. "What the law was powerless to do...God did by sending His own Son in the likeness of sinful man to be a sin offering" (Romans 8:3). The New Testament doesn't go into a litany of specifics about detailed behavior control because that's not where the power is. That's missing the point. It was the Pharisees who felt a delicious sense of control and self-righteousness through a mindset of "I can follow this list and thereby earn favor." We all know how that turned out. The fact remains that our self-righteousness is empty and insufficient. And we are not in control. A detailed list of extra-biblical rules leaves no room for the Spirit to work on hearts. It casts shadows on the beauty of the higher law--the law of love. God doesn't just want our behavior...He wants our hearts. We are often quick to acknowledge the Lord and seek His guidance in extraordinary situations. However, we assume we can “carry on…the ordinary matters of the day without his counsel.” God calls this self-idolatry and pride. How often I live as if I...am sufficient in and of my self to handle most things! Note that two completely separate blogs have now talked about this within the last 24 hours. I seriously doubt Mark Lauterbach and the Mahaney women consult each other before posting, so this tells me one thing: It's God trying to get my attention. Unfortunately, He knows He has to tell me more than once, from more than one source, for the light bulb to go on in my head. Wow! How kind of Him to make it so clear that I need to sit up and take notice! Who says there's no such thing as a free lunch? Or in this case, free music. In our world of illegal mp3 downloads, most performing artists are filing lawsuits to ensure payment for their work--they're outraged at the idea of giving it away. But not Derek Webb. Webb's newest CD, Mockingbird, was released in December of last year. But on September 1, he began a three-month promotion, offering free downloads of the entire CD. To anyone. No strings attached. Not just listen to, but actually download and keep all the songs. Visit FreeDerekWebb.com, enter your zip code and email addresses of five friends who might like a free CD (don't worry--they promise not to save or distribute these addresses). Then start downloading. Webb encourages you to take the ten bucks you would have spent on a CD and donate to a charity (he lists a few on the download site), but there's really no catch. my most recent record 'mockingbird' deals with many sensitive issues including poverty, war, and the basic ethics by which we live and deal with others. but i found that music has been an exceptional means by which to get this potentially difficult conversation going. and this is certainly an important moment for dialogue amongst people who disagree about how to best love and take care of people, to get into the nuances of the issues. ...we hope this bold campaign will provide a jumping off point for conversations about all of these issues, and communicate my commitment to playing my part in starting them. I've had Mockingbird playing in my car for about two weeks straight. It's a great CD. And I figure if someone's going to give me a free CD, the least I can do is think through and talk about his ideas. Head over to the website and download the album, and then stay tuned--I'll be blogging about my current favorite song from the album later today. I hope you'll join the conversation.